If you listen closely, there’s plenty to hear at a hockey game. Or practice. There’s the distinctive “scraping, swooshing” sound a pair of skates make as a player pivots and rushes up ice; the sharp “clack” of a wooden stick slapping a vulcanized rubber puck; and the soft “pffft” the puck makes when it comes to an abrupt stop inside a goalie’s glove. 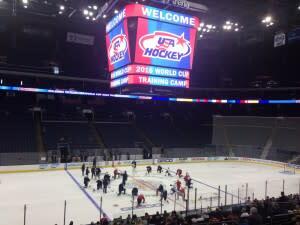 All of these sounds, and so many more, echoed and whispered throughout the intimate setting of the OhioHealth Ice Haus at Nationwide Arena as the members of Team USA practiced on Wednesday in preparation for the upcoming World Cup of Hockey. Team USA will take on arch-rival Team Canada on Friday night at Nationwide Arena in an exhibition match that is sure to have the intensity level of a World Cup game. “I love hockey; I don’t care who’s playing, I want to see it and these are the best players,” said Francis Spychaj. Francis and his wife, Joan, were at the practice, which was open to the public. It was an up-close look at a professional hockey practice – and an earful of the many sounds of hockey played at the highest level. “I’ve never been to a team practice before,” said Andy McClain, a long-time Blue Jackets fan. He too marveled at the speed and skill all around him. How big of a fan is McClain? He was wearing a Brandon Dubinsky jersey. No, not Dubinsky’s Blue Jackets jersey. There were several of those at the Ice Haus. McClain was sporting Dubinsky’s Alaska Aces jersey from the short time the Team USA member played for Alaska during the 2012-13 NHL lockout. It was the only one at the ice rink. McClain will be at Friday’s game. The public got to see Team USA first work on special team play – such as power plays and short-handed situations – on the Nationwide Arena ice. Then then players – and fans – walked over to the Ice Haus. Blue Jackets coach John Tortorella is also the Team USA coach, and put his players through a fast-paced, action-filled workout. The players were split into the red, white and blue teams. Goalie Cory Schnieder had an American flag motif on his pads. The fans got to see a rink full of amazing skills. Tortorella first had his team work on 4-on-3 situations that saw players racing up and down the ice in a constant sprint as they displayed the puck-handling skills that make the stars of their sport. Several times Tortorella blew his whistle and gathered his players around him in a circle to do some teaching. “I like how even at this level he’s still teaching them, that’s the sign of a good coach,” McClain said. Next, Tortorella called for a series of 6-on-6, half-ice drills in which there were a lot of bodies on the one side of the rink and not many open lanes or passing opportunities. The Blue Jackets coach said after practice that when coaching a team full of all-stars the best thing to do “is get out of their way and let them play.” Tortorella added that he learns from his players. “They have that creative mind and skills” and instinctively make plays a coach could never diagram on a chalkboard. In addition to Dubinsky, Jack Johnson of the Blue Jackets is also a member of Team USA – and was proud to show off his arena and city to his teammates. Although he declined to say where Team USA is staying, Johnson said it’s within walking distance of Nationwide Arena and that many of the players actually do walk over for practice. “You kind of learn the back ways to get over,” he said. In their spare time in Columbus, Johnson said Team USA members do what hockey players do in their off time: eat and play golf. Johnson believes the Team USA practices and game against Canada at Nationwide will help build excitement for the Blue Jackets.